I have recently been working with a UK charity called National Estate Churches Network (NECN). I’ve been helping them rebuild their digital presence after a string of issues, both technical and otherwise, caused them to lose their domain name, website and email addresses. As a knock-on effect they had also lost access to their twitter account: they didn’t know the password or it had been changed and password reset email address wasn’t accessible anymore due to the lost domain name. Officially, twitter doesn’t help anyone to regain control of their account in this sort of situation. 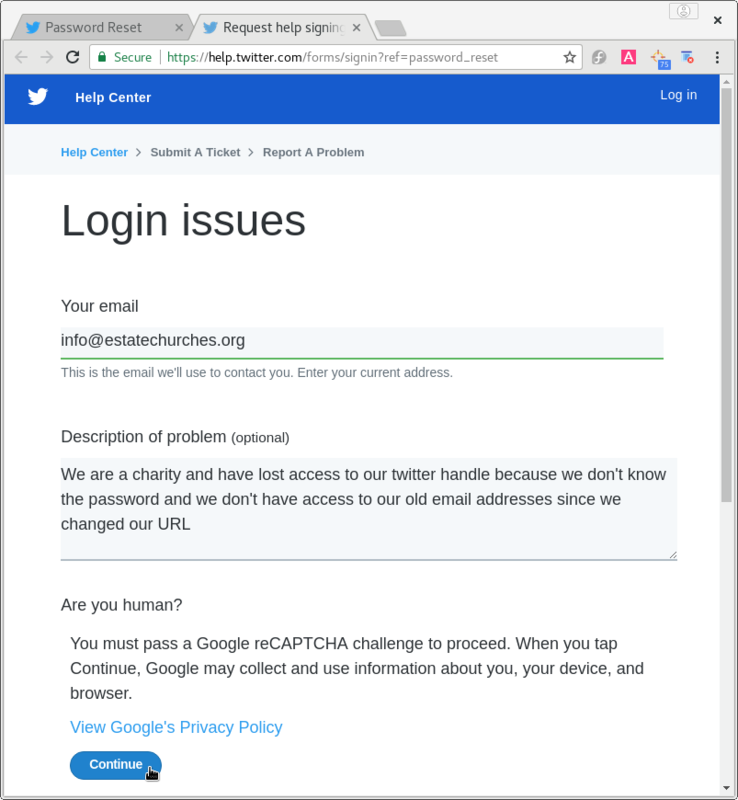 However, for SME’s and charities using email/password to log into twitter, it’s (presumably) quite easy for any disgruntled member of staff to hijack the Twitter account and lock out the owners. Therefore I believed Twitter would have a method to provide assistance: and they do! This process is only suitable for organizations and requires some time and patience! 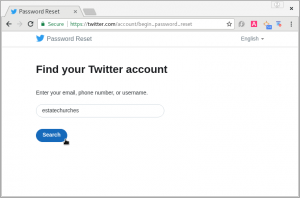 If you have ANY chance of regaining access to your old email account in order to reset the password normally, that would be a much better idea – the process with twitter is frustrating and long. Follow each stage of this process as described below. 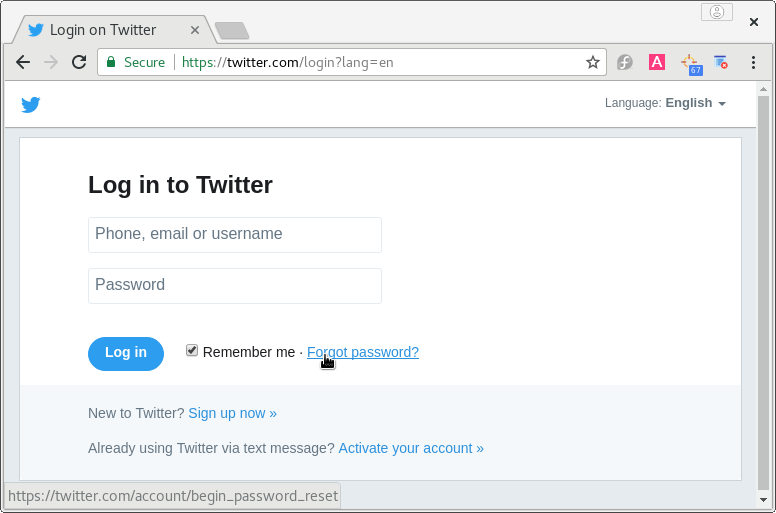 Go to twitter.com (log out of any other account you have). You should see the log in screen. 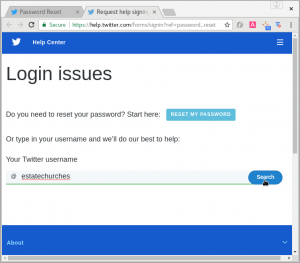 Click the Forgot password? text at the bottom right. It will then ask you to search for your twitter account. 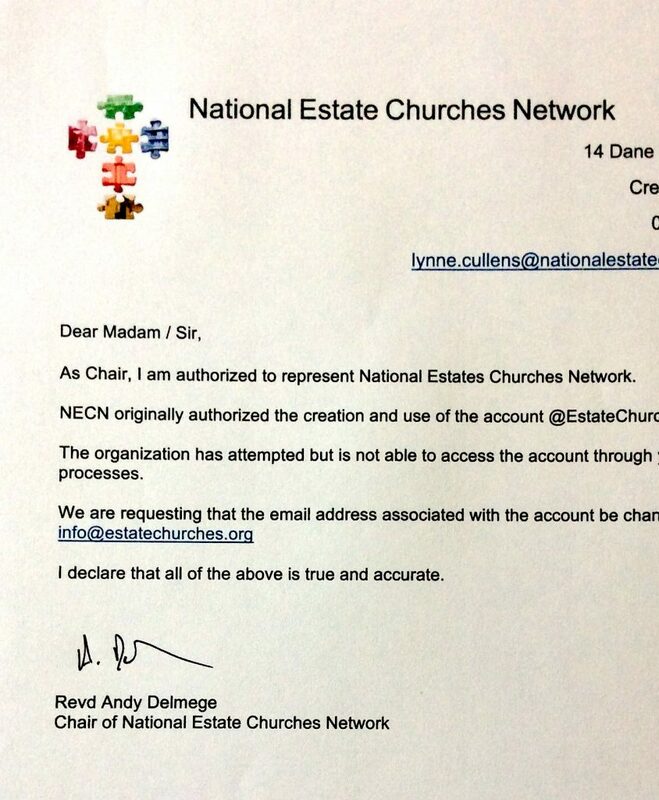 I suggest using the handle – this this case it was EstateChurches. 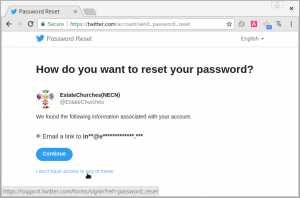 Then it will suggest that you send a password reset email to the email address(s) registered on the account. If you have access to any of these email addresses you don’t need to go any further, just reset the password. However, if you don’t have access then keep going: click I don’t have access to any of these at the bottom of the page. 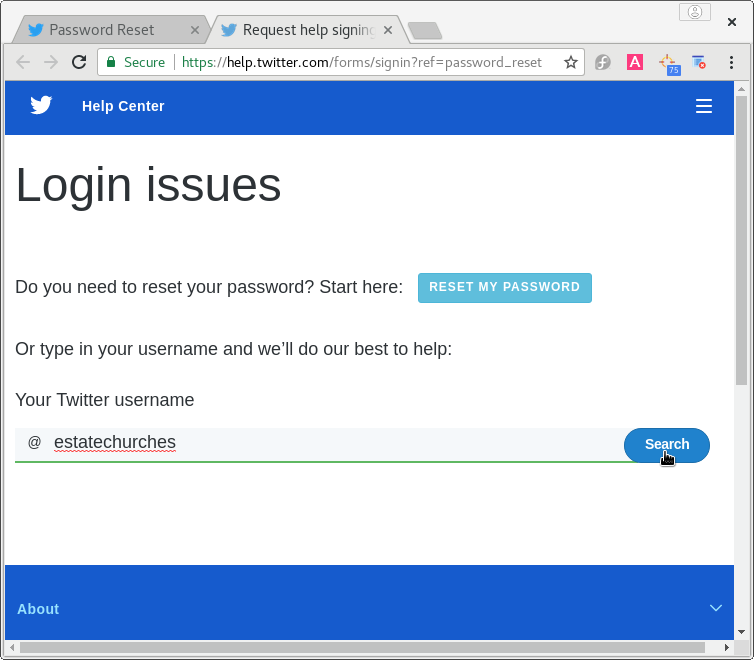 Twitter will then move you over to the Login issues process. First it will again ask you for your handle. Fill it in and click Search. Then you need to fill out a short form. First put your NEW/CURRENT email address in the box. Next will follow an email exchange. You need to reply really quickly and with precision to these emails or Twitter will close the process and you have to start again. It took me FIVE GOES to get this right. It’s annoying, but worth it to get your account back! 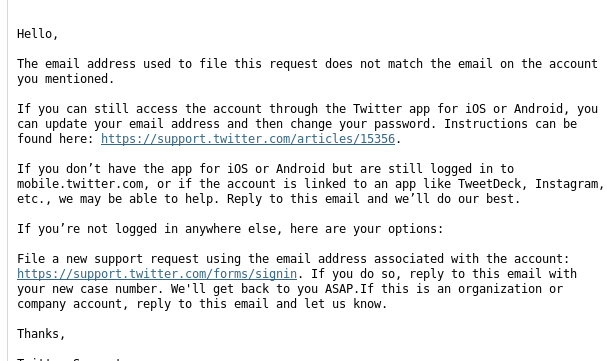 First twitter will email you and effectively tell you to go away (unless you are an organization). I suggest using the same words that they use – so at the end of their email to you, who did they specify you must be in order to receive help? Call yourself that. In this case, technically the account belongs to a charity, but I used phrase organization / company because previously, when I had used the word Charity instead, they didn’t reply. I suspect they are using a bot to scan for the magic words! Therefore, it can’t help to keep it short too! Next they will reply and ask you to write them a letter on letter headed paper. So that is exactly what we wrote, using I instead of you etc. If you don’t have letter headed paper just create a header with logo, organization name and address etc in a word processor along with the letter. It is important that you print the document, sign it with a pen and then scan it in – they probably won’t allow a digital signature. Once you have uploaded the file, hopefully, twitter will reply and tell you they have associated your new email address with your twitter account. 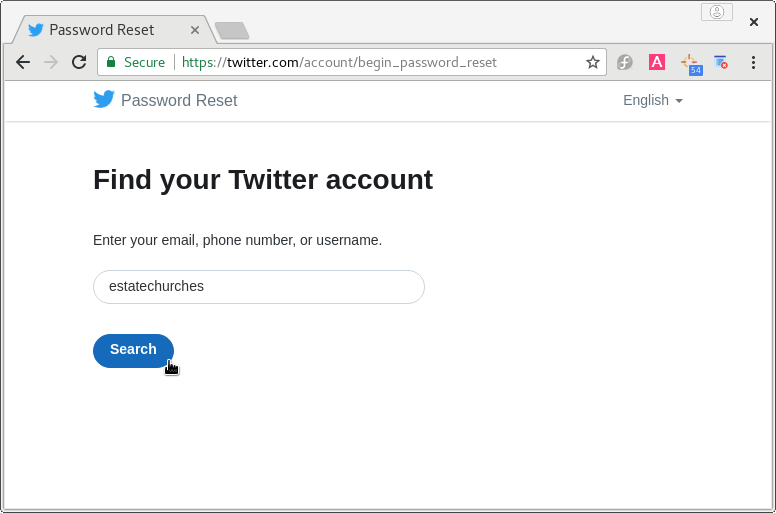 To access the account you need to click the reset password link and then enter in a new password. 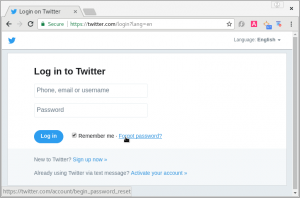 This will now be your twitter password: make sure it’s a good’un! You will also get an email asking you to confirm your email address, do that too! 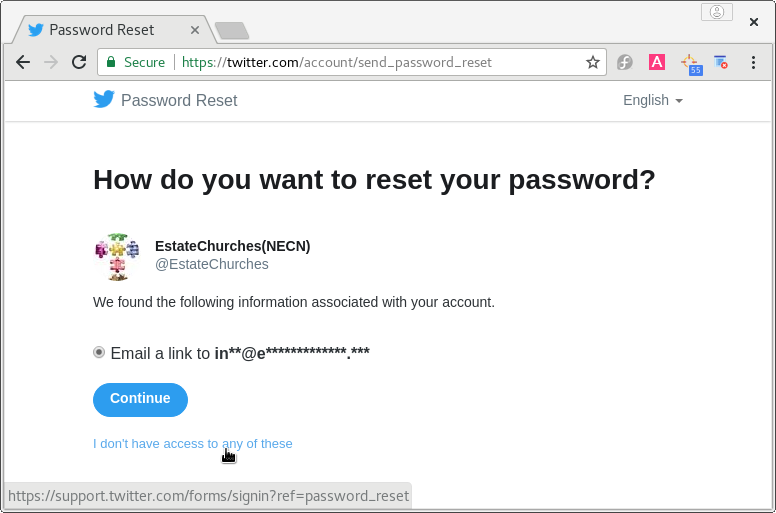 I suggest adding multiple ways to reset your password for the future! Please let me know what problems you encountered during this process. When using a different email client, I got an email reply saying that the in-box is not monitored. I believe this is caused by the way some email systems edit the subject and headers of the email. In that situation I suggest using a different email interface (speak to your email provider for help).